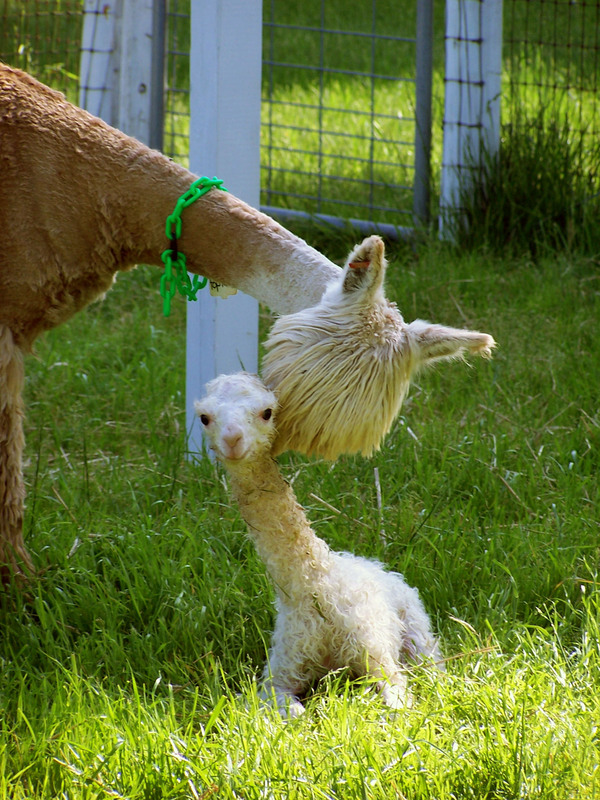 Alpaca Info - Suri and Huacaya Alpaca Sales and Stud Services in MD: Ameripaca Alpaca Breeding Co.
Alpacas are members of the camelid family. They are closely related to vicuñas, llamas, and camels. Alpacas originate from the mountains of Peru, Bolivia and Chile. While alpacas have adapted very well to the United States, these animals are rare enough to be considered exotic livestock. Alpacas are often confused with llamas. In actuality, alpacas are smaller than llamas and have spear shaped ears. Llamas, on the other hand, are much larger, more barrel chested, and have banana shaped ears. Due to their larger size, llamas are often used as pack animals. The smaller bone structure of the alpaca makes it an unlikely, if impossible, candidate for hauling heavy loads. At the withers an alpaca stands at about three feet tall and weighs around 150 pounds full grown. But alpacas and llamas exhibit more than physical differences. Alpacas are also more timid than llamas. It is not uncommon to find a “guard” llama within a herd of alpacas as protection from coyotes, dogs and other small predators. There are two different types of alpacas, the suri and the huacaya. The fiber of the suri grows in long, lustrous locks parting at the spine of the animal. The fiber of the huacaya is more like that of a teddy bear, soft and more uniform in length across the entire body. 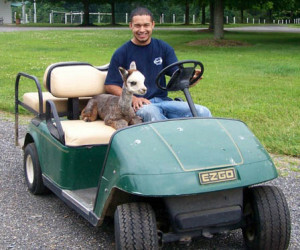 We love and raise both types of alpacas here at Ameripaca. Every alpaca, like every person, maintains a unique personality. Some of our animals are very laid back (such as Cisco pictured in the golf cart above), while others are more noisy and inquisitive. In general, alpacas are docile, quiet, and intelligent animals. An alpaca can be halter-trained within a matter of days and trained for agility within a few weeks. Like any animal, the more alpacas are socialized the more friendly they become. If left unsocialized, alpacas can be skittish and timid. Female alpaca are very maternal and become very upset—even soliciting the help of humans—if they happen to loose sight of their baby in the field. An alpaca’s lineage may also dictate whether or not it will be a particularly friendly animal. At Ameripaca, we specifically breed for temperament, and many of our males are known for throwing very sweet offspring. Female alpacas are very maternal. Mothers coo and cluck to their babies and become very upset if they happen to loose sight of their baby in the field. Mother alpacas will issue a high pitched hum when they have misplaced their cria. At Ameripaca, it is not uncommon for a mother to come running to humans for help in locating a baby that has wandered too far. Alpacas can, and do, spit, In our experiences, however, alpacas rarely spit at humans unless seriously provoked. Spitting generally occurs between alpacas to assert dominance and during quarrels over food. People raise alpacas for a variety of reasons, they can be enjoyed both as pets and as a business investment. Alpacas are easy livestock and provide a gentle and enjoyable farm lifestyle. Primarily alpacas are raised as fiber animals. Alpaca fleece is shorn once a year in the spring. One alpaca can grow between three and eleven pounds of fiber. What makes alpaca fiber special? Overall alpaca fiber is highly valued due to its unmatched softness, warmth and easy processing. Color: Alpacas produce naturally colorful fleece ranging from pure white to true black. There are also multi colored and appaloosa alpacas. Consequently alpaca fiber does not need to be dyed to provide a great color. Hypoallergenic: Alpaca fiber is also hypo allergenic, meaning that people who are allergic to sheep wool can wear alpaca. Quality alpaca products are very fine and comfortable. Warmth: Alpaca fiber has more thermal capacity than almost any other animal. Due to microscopic air pockets in the fiber alpaca is simultaneously light weight and warm. Processing and Maintenance: Alpaca is less expensive to process than sheep’s wool due to its lack of grease or lanolin. Fine fleeces also do not have to be de-haired like cashmere or camel. Alpaca garments do not tear or pill easily and will last a lifetime if kept from moths. 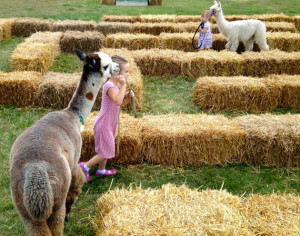 There are a variety of types of alpacas ranging from pets to show stoppers. Consequently pricing for alpacas varies greatly as well. Pet alpacas from Ameripaca are priced at $250 and up. Pricing for show quality males at Ameripaca begins at $500-$1000. Female alpacas are generally considered more valuable than male alpacas, with the exception of outstanding herdsires. Prices for our quality females range between $4000 and $15,000. At our most recent auction Ameripaca sold a female for $11,000. Regardless of where you choose to buy, we recommend investing enough money in your purchase that you can be assured your animals are healthy and finding a breeder that will provide customer service for years to come. How does one care for an alpaca? Alpacas are generally “easy keepers.” They require less food and land than many other farm animals. 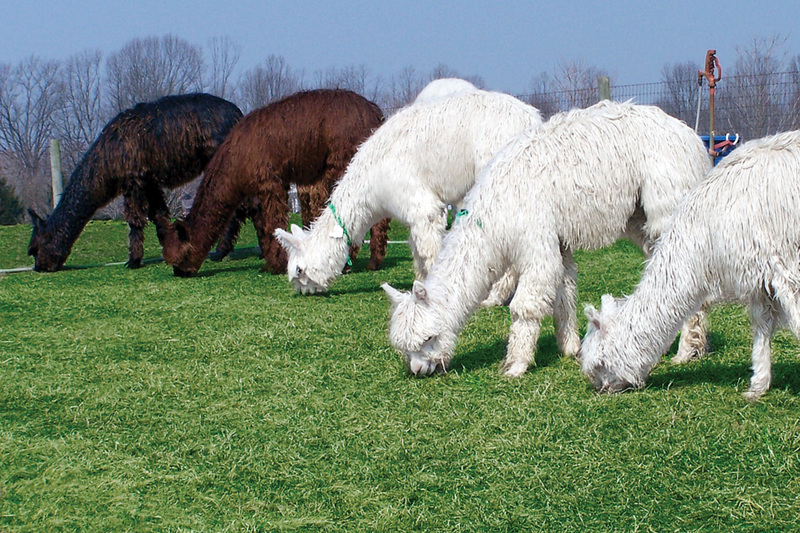 One acre of land can sustain between 5-10 alpacas depending on the quality of your pasture. Here at Ameripaca, we find seven fit comfortably on one acre. Alpacas are very herd-oriented and must be kept in groups of three or more. Because of their soft pads and toenails (as opposed to hooves), alpacas are easy on pasture. They are also fairly gentle grazers and tend to trim grass rather than destroy it entirely. Alpacas are well kept in simple barns. A three-sided shed works just fine to provide shelter from the sun, rain, and snow. Electricity in your barn is a necessity for fans in the summer. Alpacas must be shorn once a year to avoid over-heating and infertility. Alpacas do not tend to be escape artists or jump very high. At Ameripaca, we use a 2-inch by 4-inch rectangular woven wire called “no-climb fence.” A board fence with wire fencing between the boards also works well. Electric fencing is not recommended for alpacas. During “herd health,” a monthly check-up, we routinely weigh every animal to ensure they are not loosing weight, and provide medications if necessary. Although alpacas are exotic animals, they generally do not require much medical attention. Alpacas receive a rabies vaccine once a year, a CDT once a year, and an injectable dewormer every sixty days.